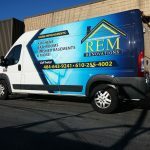 An effective and engaging way to promote the products and services your business offers is my utilizing company/fleet vehicles and using auto wraps to turn them into mobile advertising boards. Maximize the time spent on the road, stopped at lights, or parked at a client’s property with a message that sends a clear value to your target market. Our team are experts when it comes to installing car wraps, vinyl vehicle wraps, boat wraps, trailer graphics and fleet vehicle wraps. We work with companies looking to explore efficient use of their vehicles and new marketing opportunities to grow revenue streams. We offer solutions that match your requirements while presenting a professional, affordable way to get more people talking about your business. Call Liberty Signs, Inc at (864) 210-1115 for your Free Consultation with a Vehicle Wrap Expert! 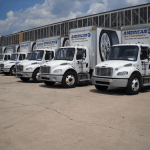 If your organization rents, owns, or buys vehicles for business purposes, take full advantage of their use and turn them into moving advertisements to help promote your company. Generate interest in sales and offers with targeted messages, investing in designs that help promote your business to local customers and present yourself as a reputable, established organization that your customers can trust. When you or your staff hit the road, or visit customers at home, the time you spend behind the wheel is time spent marketing your company absolutely free. 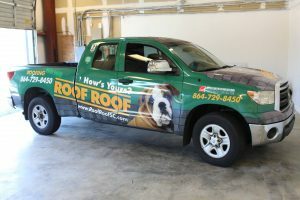 Connect with more customers by using vehicle wraps that are as effective for a one-person business as they are for a national organization. At Liberty Signs, Inc, we work with our customers to ensure the end product is exactly what you want and more. We can work from existing designs, or create new, aesthetically pleasing artwork, to manufacture and install on your vehicles. This gives you complete freedom over the marketing message you want to send and control over things like logos, text, graphics, or high-resolution images. Every business has their preferences. While some may want their vehicles wrapped from top to bottom, others may only want smaller parts or elements done. 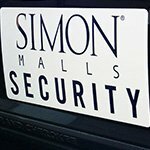 We offer a range of solutions, including vinyl graphics, vehicle magnets, and partial vehicle wraps to fit every need and budget. 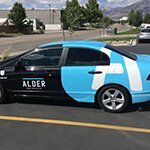 We use partial car wraps made up of eye-catching, enticing, and precise designs, to capture the attention of your target market as you drive your vehicle around. This option offers complete flexibility, allowing you to choose where on the car it is installed. 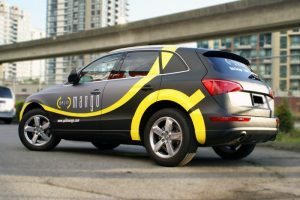 Our expert team of wrap designers, manufacturers, and installers will create a partial wrap that matches the shape of your car, contouring to the bodywork and avoiding excess material/bubbles that will have a negative impact on people who see it up close. On a tight budget? Partial wraps are a great solution. 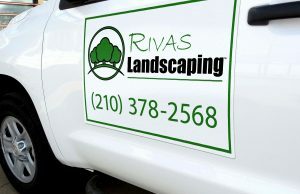 Promote your business and raise brand awareness using single vinyl graphics on your vehicle. 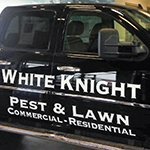 Individual graphics and cut vinyl lettering are popular for those who want to create a single, impactful statement. They also allow the freedom and flexibility to easily update and amend them if necessary. The best results are usually achieved when sticking to simple logos and text. 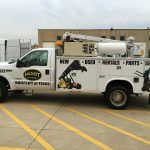 For those who use their personal vehicle for work, magnet designs are a fantastic way of mixing business and pleasure without being stuck between the two. The ability to easily be removed and reapplied at any time, vehicle magnets offer great versatility, allowing you to conform when living/parked in an area that has signage restrictions, or to easily change your branding to suit your needs. 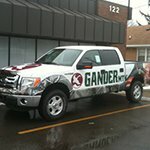 We are able to wrap any type of vehicle that your business owns or uses in day-to-day operations. We will create personalized artwork, produce them to the highest standard, and send our team of professional installers to apply them. For businesses considering vehicle wraps, we offer full-service delivery. 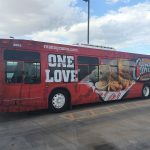 We help customers raise their brand profile, increase revenue, and target new markets by using your vehicles to catch attention wherever you go. This includes creating consistent signage across your building/premises with your indoor signs, outdoor signs, vinyl signs, and any custom signage your business may utilize, so that wherever your customers are they see a professional and cohesive brand message. Whether you have one company car or one hundred company cars, you have a marketing tool that is going un-used every day it doesn’t have a promotional wrap on it. 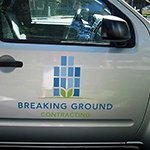 We use visually-attractive artwork to promote your business, meaning that while you go about your day-to-day tasks, more and more people are seeing your brand. Wraps are long-lasting and durable, making them a great long-term investment. For businesses that have multiple offices, or visit clients at home, vehicle wrapping offers an effective and reliable method of promoting your company and improving the customer experience. 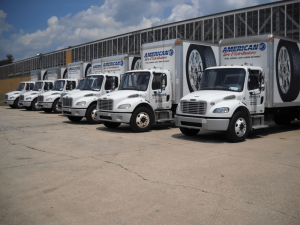 We provide complete vehicle wrap transformations while maintaining on-road compliance. At Liberty Signs, Inc our number one aim is to give customers complete satisfaction in the work that we do. 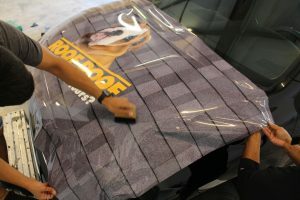 Our team consists of dedicated wrap professionals, committed to delivering attractive and custom artwork that helps connect you with more customers and potential customers. We help you utilize un-tapped resources by creating a moving army of branded advertisements. Starting with a free consultation, we want to know the challenges your business faces while simultaneously discussing the best options for your business with the budget you have. 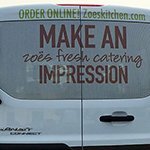 Our design staff will then create sample artwork to showcase how your vehicle wrapping will look once applied. 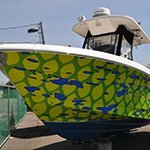 They will combine the industry knowledge and design techniques with manufacturing know-how to create designs that do exactly what you ask them to. The chosen design will them be passed to our team of skilled manufacturers who will use our Greenville state-of-the-art facilities, paired with the best materials available, to manufacture the end product for your vehicle. Whether your design is one single piece or a series of individual pieces that make up a final design, we never compromise on quality or attention to detail. Once the design is manufactured, our installation team will contact you to arrange a convenient time to install the artwork to your vehicles. We ensure that the design looks perfect, working to minimize any wrinkles or bubbles for an attractive finish from any distance. 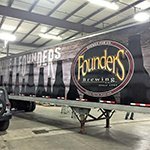 For companies with vehicles that already have wraps in place, we can amend, update, and repair designs. From small changes to complete redesigns, no challenge is too big for our team. 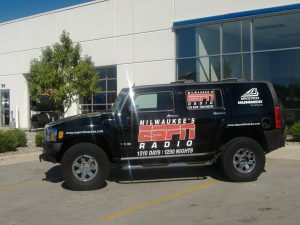 Regardless of how big your business is, if you own a vehicle, you can put it to work as a mobile advertisement for your brand and business. We provide free consultations to businesses exploring the use of their vehicles to promote their company and help them send clear, concise message to their target market. Call Liberty Signs, Inc at (864) 210-1115 for your Free Consultation with a Vehicle Wrap Specialist!